Some dude on Twitter is calling himself Jesus Christ and he’s trolling me. He’s added me to a list he labeled “Evil Democrat Vultures” and has called me some other pretty ugly names. As an expert on ego, let me say it takes a special sort of Messianic complex to call yourself Jesus Christ. And based upon my religious education, I’d hate to be that guy on the last great Day of Judgment. When the roll is called up yonder, I’m thinking Twitter handles aren’t going to count. Normally, Jesus Christ showing me special attention would give me joy, joy, joy, joy down in my heart. But I hadn’t really planned to meet Jesus just yet. Plus, he’s meaner than I believed or expected. And as hard as it is for me to admit, Jesus and me don’t seem to see eye to eye. Speaking of eyes, he tends to be more of an Old Testament “eye for an eye” guy than a New Testament “turn the other cheek” sort of fellow. It also feels wrong to block Jesus. So let’s just say that I’m putting this sinner behind me. #Blocked! 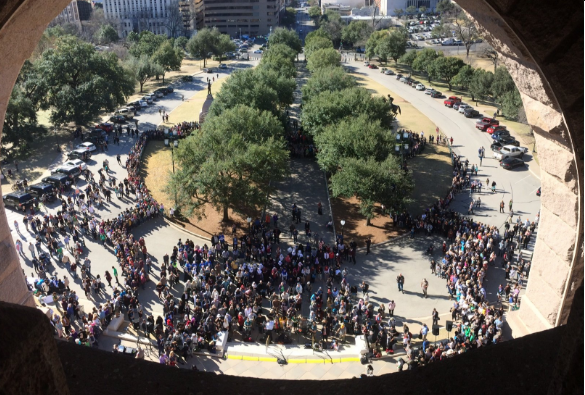 Last week, we had an amazing show of compassion and humanity at the Texas Capitol when about 1,000 people showed up as reinforcements for Texas Muslim Capitol Day. In the face of the Muslim ban from the Trump administration, the ring of supporters around the Muslims who came to their state Capitol pushed back against the hateful message sent days before. Unfortunately, it didn’t last long. The Senate State Affairs Committee voted early Friday to advance Senate Bill 4, which targets so-called sanctuary cities in order to score political points at the expense of undocumented immigrants. Senate Bill 4 will come up in the Senate today, and there is nothing I can do to stop it. I know that disappoints a lot of you. While I oppose Senate Bill 4 to the core, that’s not enough this time. The rules have changed. And the tenor of politics has changed…for now. The hundreds of people who showed to testify in opposition to Senate Bill 4 give me hope as do the folks who came for Texas Muslim Capitol Day. You all have showed those in control of the Capitol that discrimination won’t go answered.